Just 60 miles east of Portland, Oregon and just south of the village of Government Camp, Summit Meadow Cabins are nestled in a small oasis of private land surrounded by the Mt. Hood National Forest. On the south slope of Mt. Hood at the 3800 foot elevation level, Summit Meadow Cabins are in a wooded creekside setting, offering a special kind of tranquility. 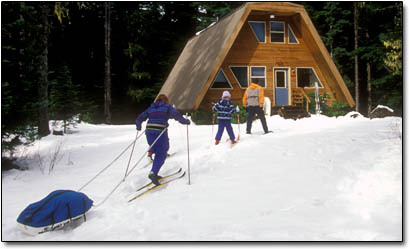 In winter, guests leave their car in a Snopark and cross country ski or snowshoe 1-1/2 miles to reach the cabins. A small sled, especially designed for the X-C skier and snowshoer is provided for hauling gear. The Village of Government Camp (1.5 miles). "Govy" offers downhill, cross country ski and snowshoe rental and repair, mountain bike rentals, restaurants, taverns, convenience grocers, gifts and T shirts, gasoline and a post office as well as the Mt Hood Cultural Center and Museum with its public internet access and exhibits. Multorpor SkiBowl (1.5 miles). Year-round activities include downhill skiing, night skiing, alpine slide, horseback riding, go carts, bungie jumping and more. Trillium Lake (2 miles). A scenic high-mountain lake with fishing, non-motorized boating, swimming, and breathtaking views of Mt. Hood. Summit Ski Area (1 mile). A family-oriented downhill skiing and snow play area. Timberline Lodge National Historic Site (6 miles). A world-famous year-round lodge and ski area, with a restaurant and interpretive displays & free summer tours. Mt. Hood Meadows (10 miles). Meadows offers Mt. Hood's largest alpine ski area, including night skiing. Cooper Spur Resort (25 miles) restaurant, special events, winter tubing, downhill & XC skiing, summer mountain bike trails. Hoodland Area (12 miles). A cluster of small communities offering restaurants, taverns, gifts, galleries, golf, churches, medical facilities, groceries, public library and visitor information. Hood River Valley (25 miles). Along with the nearby Columbia Gorge National Scenic Area, this region features windsurfing, the Mt. Hood Railway, fruit orchards, shopping, a hospital and other amenities. Within an hour's drive you can be in the desert at the outside heated pool at Kaneetah Resort, on the Deschutes River in Maupin, to the Columbia River at Hood River, the Discovery Center in the Dalles and almost to the White Salmon River in Washington. 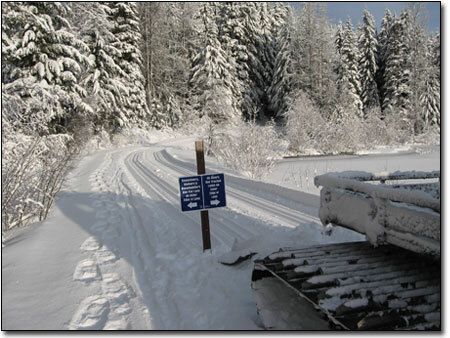 Much of the adjacent cross country ski and snowshoe trail system has machine groomed tracks, set by Summit Meadow Cabins. In a unique partnership with the U.S. Forest Service, we set the tracks each week, with frequency being dependent on the snow conditions. Snowtrails in this area have been improved so they can be groomed for cross country skiers and snowshoers with a minimum of snow. It is hoped that donations by those using the groomed tracks will support the grooming. Donations can be made at the Trillium Lake trailhead or mailed directly to the Zig Zag Ranger District 70220 E Hwy 26, Rhododendron, OR 97049.